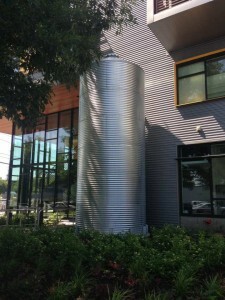 RAINBANK rainwater collection & storage systems are customized exactly for our customers’ needs (potable and non-potable) and are efficiently integrated with stormwater management; meeting both state and county requirements. Architects, Designers, Builders and Developers collaborate with us. Homeowners appreciate our face to face consultation, feasibility study, flexible/scalable solutions and accredited, licensed design. 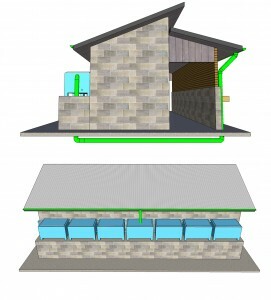 Rainwater collection is appropriate for small scale residential needs and large scale commercial applications. It can be sanitized/filtered for drinking (potable use). 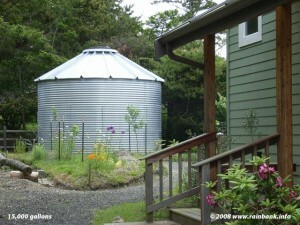 Our customers understand that rainwater harvesting (collection & storage) is a viable alternative water supply and is available to just about anyone. Please fill out our short form below to access which options are available and appropriate for your needs. RAINBANK contributes time, knowledge and expertise designing for remote and developing areas. Ken Blair is a founding director (2010-2014) of Bank-On-Rain , a not for profit foundation designing a green planet, one raindrop at a time. Engineering & permitting requires meeting all the legal requirements from county and state agencies, our focus is cost effective, fast & hassle free. If you are already working with an architect or designer outside of RainBank, we will assist and coordinate to make everything easier. Permitting can be frustrating and complex, especially when the rules change. Leave the hassle to RAINBANK. RainBank designs and assembles customized kits & blueprints for do-it-your-selfers, those in remote locations, tract housing developers and large companies. For more information please contact us, using the form below.